Dubshed in 2016 continues to shine as one of the best motoring shows seen in recent times. It moved this year to the Eikon Exhibition Centre near Lisburn, and it seems the organisers wasted no time in ensuring they made use of the extra space on this expansive site. First and foremost Dubshed is, of course, an event focused on the Volkswagen-Audi scene, and as previous years the standard of cars and exhibitors was extremely high. Cars from throughout Europe are now making their way here for us to see, and this brings a fantastic variety to the show and a real treat for us punters. The main halls consisted of the show cars ranging from classic, concours standard Mk1 Golfs (a stunning white Clipper was my personal favourite), right through to the latest models from the marque with custom coachwork, re-trims and air hydraulic suspension. Absolutely stunning as these are, Dubshed has spoiled us over the years as these high standards of VAG show cars become par for the course. The Audi 100 on the I Love Bass stand, on air of course, was a definite crowd puller as it was regularly was to be heard lifting and then hitting the floor hard! This year was different, as the same mantra of high quality and cool looks along with the extra space at Eikon meant that some superb examples from outside the Volkswagen-Audi Group really got a look in. Behind the main hall contained most of the other cars including this incredible teal Nissan Silvia S15 with a wide arch Rocket Bunny kit and very tasty 3 piece splits. These wheels are huge. They have to be to fill those arches. More superb Japanese inspired machinery in the ILB hall. BMW was well represented throughout the show with several classic M cars on show. But M Divison’s finest was eclipsed by an incredible Scandinavian – German fusion. A Saab powered E21 on the floor. Oh, and with a turbo, the size of a small planet, liberated from a digger. What’s not to like? It’s outstanding! There was more than just a break in GTi NI code on marques, there was live motorsport on site as well. The most active was most definitely the autotesting which ran throughout the two days of the show. I enjoyed watching some very talented, tight driving in an array of competition cars from Nissan Sunnys to Mini Mokes. There was even a drag strip set up for quarter mile runs at the back of the event. This meant some fast, purposeful machinery was also in attendance to knock out some times on the strip. Where’s there’s clouds of tyre smoke, you’ll find drifters. 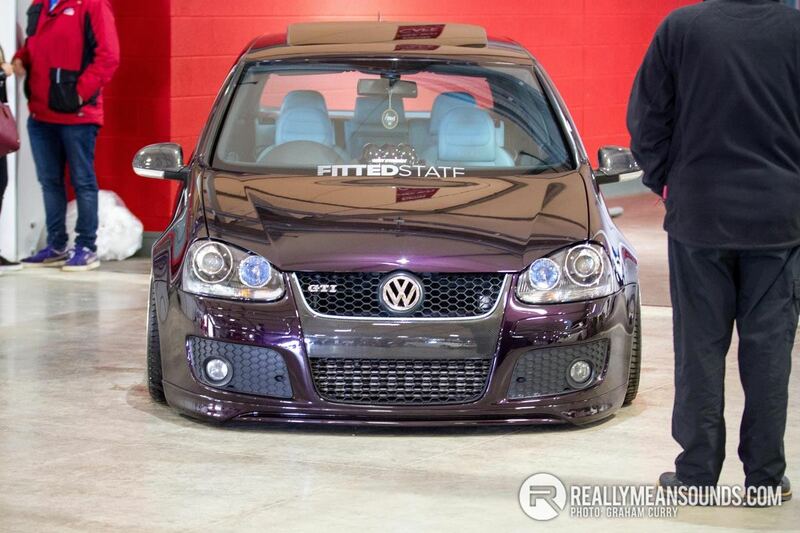 Dubshed was no exception to this rule. Dubshed organisers, GTi NI really pushed the envelope with this year’s multi-discipline motorsport and show extravaganza, clearly keen to make the best use of Eikon to ensure the £15 entry fee represented superb value for both the motoring enthusiast and family on a day out. Again I think they’ve nailed it. Hundreds of VAG show cars at the show’s core, with several more from across the broad range of marques that we all love. Add in the autotesting, drag racing and other attractions including buggies and a helicopter, an afternoon spent at Dubshed is most definitely well worth it. Just back from show. Thought it was pretty good. Some lovely motors. Drag and auto testing were a great addition. However the quality of some of the cars outside were questionable... Better cars in the car park. Took a run down with @WSM Enjoyed it, new venue is great, the stuff in the ILB hall is fantastic. Loved the black supra and the two s15's! I'm not really into the whole VW thing but the older stuff was lovely and there is plenty of non VW stuff to see. Plus a single seater formula Renault doing the drag racing, awesome! Anyone know about the red Elise that was going up the drag. Some noise and could shift. Turbo'd I think. Some nice stuff inside, outside was a bit reeky. I actually enjoyed it! :O Brilliant selection of cars and a fair few of them were petrol which was a bonus. Didn't realise how much I appreciated old VWs until today either. I also now want a Transporter camper van lol. And a caddy van. And an S8. | Anyone know about the red Elise that was going up the drag. Some noise and could shift. Turbo'd I think. Some nice stuff inside, outside was a bit reeky. That's Andy from Momentum's car I believe. Fast as fook. Andrew Mercers from Momentum. Its quick, 10 sec 1/4 mile car, rotrexed k20 with full quaiffe sequential, serious machine, got a run in it yesterday. | I actually enjoyed it! :eek: Brilliant selection of cars and a fair few of them were petrol which was a bonus. Didn't realise how much I appreciated old VWs until today either. I also now want a Transporter camper van lol. And a caddy van. And an S8. @56oval had his beautiful voice on display for the drag - always a pleasure listening :) I did love the single seater Formula Renault! Wish I'd have been allowed to bring the M4 on for a run. The surface looked nice. | @56oval had his beautiful voice on display for the drag - always a pleasure listening :) I did love the single seater Formula Renault! Wish I'd have been allowed to bring the M4 on for a run. The surface looked nice. Wasnt a bad surface to be fair, the weather really tested us all weekend but we got cars out, gutted we couldnt have had at least 20 more cars in the mix but we made the best with what we had. From what what ive seen the organisers have taken a huge risk adding so much more than just a shed full of dubs to the itinery and its paid off. I doff my cap to the Autotest guys, super slick organisation .